We’ve discussed winter driving, and touched on snow chains and winter tyres, so we thought it might be helpful to provide a bit more information about both. Winter tyres are made of a special compound with a high silica content, and have a tread pattern which means they are more flexible at lower temperatures and will brake better on ice than summer tyres. Their overall performance is not as good as summer tyres, so they’re not a year-round option, but if you live in an area that has a lot of snow and ice, they’re a good choice for winter. For much of Britain over the last twenty years or so, winter tyres would have been a complete irrelevance, although they are starting to look like a more useful choice. You still have to be sure that they’re worth the expense, which means being sure that you’ll have to drive in snow. 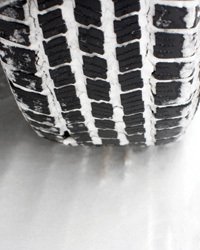 Some insurers require you to inform them if you fit winter tyres, so do check with yours to make sure. Use of snow chains is, again, not really necessary across most of the UK for most of the time. If you live in a rural area, or your road is not generally gritted, then they might be worth considering if you really have to drive. However, if your road is relatively short, you may find that a good supply of grit salt, also known as rock salt, is a cheaper alternative! If you’re considering snow chains, then do check that you can fit them onto your car. It’s not always possible because of shape or sensors in the wheel. You may even need to buy different wheels, in which case, you might well be asking if it’s worth the expense. The only answer is that you have to decide whether you will really get enough use out of them. You can only use snow chains on a road that is covered with a compacted layer of snow and ice. On any road that has been cleared, you will damage both car and road if you use chains. So this means that you will probably have to stop and remove chains once you hit any major roads. You only really need one pair of snow chains, for the driving wheels, unless you have a 4-wheel drive car. Yes, two pairs are recommended, but not really worth the expense or the time to fit them unless you are going to drive a long way with them. And do practise fitting them before it snows. And remember, even with chains on, you still need to drive carefully, and the best advice is still to avoid driving if you can.